Now that the Nathan James has negotiated the minefield, it's time for them to begin the search for Mike and the rest of the captives. As they consider the map that Peng gave them, they find that none of the islands seem viable for use by Takehaya. Fortunately for the crew, the captives orchestrate a plan which sends a signal denoting their location. The captives cover for Garnett who slips away to create the signal. Upon Garnett's return, she runs into Kyoko and begs Kyoko to cover for her so that she will not be punished. Kyoko quietly lies to Takehaya for Garnett. It's worth noting that this is the most attention that Garnett has received since being captured along with the others. All the males were given some form of resistance to perform. We watched as they plotted together and took care of each other, as Garnett was shuttled to the sidelines, once again confirming that The Last Ship has no idea what to do with their female characters when they are not in the role of love interest. Things are tense statewide. Thanks to the leaks from the Council, Michener is forced to sit down with Jacob. For the first time Michener admits that Chandler is not in China and is in fact on board the Nathan James. Michener then lies and claims that Tom is engaged in a diplomatic negotiation to release the prisoners. Naturally, Jacob is suspicious and says as much, only to be told that he is being used by the Council. When that fails to achieve the submission that Michener wants, he threatens that if Jacob goes public with what he knows that he will forever be denied access to the President. I know that I've harped on this the last few episodes but I believe that it's important to point out just how problematic The Last Ship's treatment of the media is. The writers have framed Michener as acting in the public good even as he actively attempts to stop a free press which is necessary to a transparent and honest government. We are meant to see Jacob as a dangerous trouble maker who simply doesn't know his place. Episode after episode, Jacob has been demonized from doing his job as though the media doesn't have an active responsibility to hold those in power accountable. The treatment of of Jacob on The Last Ship is some of the worst right wing propaganda I've seen in this genre to date. 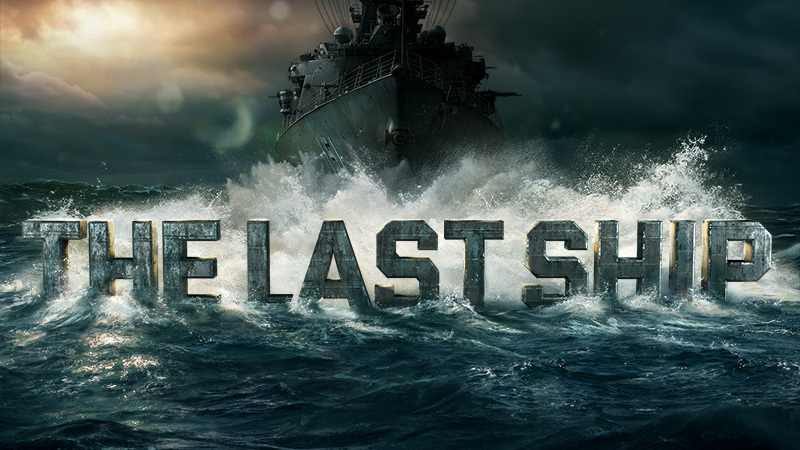 With the propaganda out of the way, The Last Ship then returns to its plotless action movie ways. Fearing that the jig is up, Takehaya leads the captives away. By the time Tom et al arrive at the camp, they find it deserted. They are completely unaware that at least some of Takehaya's force is hiding directly under their feet. It's Sasha who finds the trail that Takehaya took with the captives. As they follow the trail, two men are mysteriously killed. When Tom checks with the Nathan James, radar does not pick up any living person anywhere around them. Once again, it's Sasha who realises that the reason they cannot see Takehaya's men, is that they are hiding in tunnels. Okay pause. I'm supposed to believe that Tom is some big military leader and yet he couldn't figure this out. He is in a jungle atmosphere and still expecting traditional engagement? Did he never study the Vietnam war? Once again the captives take action. Diaz is able to cut away his bindings and the crew covers for him. Diaz makes his way to Tom and the battle begins. Takehaya manages to slip away in the confusion and Cruz is killed. Tom and Mike shake hands with tears in their eyes cause they're far too masculine for more of a display regarding their relationship. Yes, that's all the snark in the world. It's time to get the hostages out because they are weak. Tom doesn't get to celebrate his victory for long because the Chinese show up. Damn those pesky Asians are always getting in the way. Hidden under the camp, Kyoko is struggling and Doc is commanded to fix her by giving her a blood transfusion. Miller picks up a massive stick and takes out one of his captives only to be stopped by Toshiro, who promptly points his gun. Doc Rios picks up a pair of scissors and stabs Toshiro. Doc is clearly effected by having to kill someone, having spent his time on the Nathan James administering to those who need him. Miller makes his way outside and before he can reach Tom, he is grabbed by Takehaya who is still defiant in defeat. Those damn Asians, never knowing when they're beat. It's Kyoko who deescalates the situation by arguing that the best thing for their unborn child is for Takehaya to concede defeat. The MSS makes their ground assault and Tom et al head inside the camp. With ammo running out baby Burke and Jesse fly over trying to provide aid. Due to the trees, Baby Burke isn't able to get in any clear shots forcing him to ask the Nathan James to target the helicopter, promising that Jesse will get out of the way of the bomb before it can detonate. Ganderson calls this plan dangerous but she doesn't actually make a decision because Big Burke takes over and makes the final decision. This is once again is another example of the ways in which The Last Ship screws over its female characters. The writers specifically had Tom place Ganderson in charge and then allowed Big Burke to completely undermine her leadership actions and then when it counted, allowed Big Burke to make the important decision. The Last Ship has women as window dressing but when it counts, this show never gives women any real power. Everyone is back on board The Nathan James. Tom tells Mike that as soon as Mike is ready, he'll turn over the ship. We all know that as long as the Nathan James is at sea that Tom will be in charge. Both men come to the determination that they have to figure out what is going on in Asia. Yes, I rolled by eyes. Stateside, Michener is fit to be tied. The Nathan James was supposed to report in quite some time again and the nation is waiting for answers. Kara tries to explain that given the situation it may mean that The Nathan James doesn't have a secure line of communication. In the territories, people are starting an uprising. The clock is ticking for Michener.